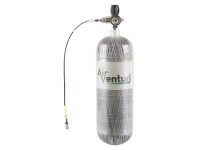 Air Venturi Carbon Fiber Air Tank & Fill Station, 4500 PSI, 88 Cu In. Episode 11: Turkey Takes a Toll. 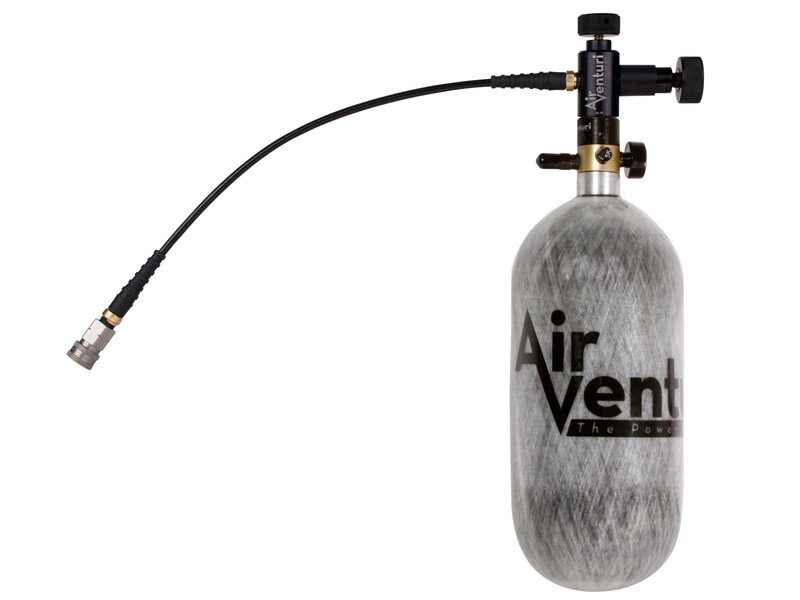 Air Venturi carbon fiber tank with high-output regulator. 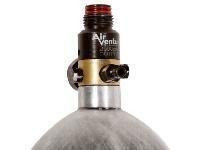 Use this Air Venturi tank for airguns only. It should not be used for filling paintball guns. 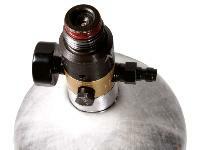 Neck of the carbon fiber tank and high-output regulator. 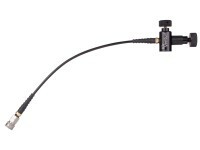 This high-pressure tank must be filled through the male quick-disconnect on the neck. 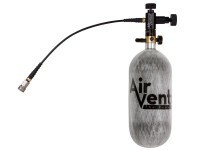 Before buying, please contact your local air supplier to see if they can fill this tank. 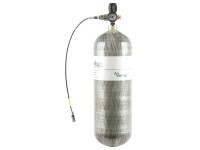 Paintball stores may be able to fill your tank, so you may be able to find a fill source through them. Fill 'er up! This handy carbon fiber tank is small enough to tote around in the field in a backpack while hunting or eliminating pests. 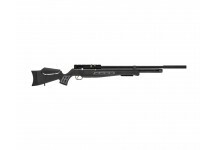 Easily fill your air rifles and pistols with the easy on/off quick-disconnect coupling. 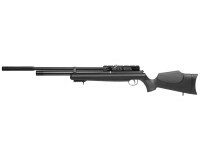 If you shoot field target, this could take the place of a buddy bottle. Since it's filled to a pressure of 4,500 psi, you'll get a lot more refills to your 2,900 psi PCP rifle than you would with a buddy bottle. More refills, less hassles, no pumps, no heavy tanks -- it has everything going for it! 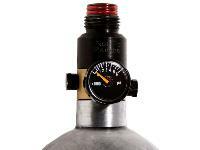 Things I would have changed: Air Venturi should use a more accurate gauge. I thought I would be able to get a consistent 2900 psi. Instead I am only getting 2500 psi. My Benjamin 90 ci in much better without any regulator. 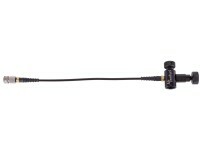 I would be nice if the regulator were adjustable by the buyer. Use a larger gauge that is easier to read. What others should know: I do not recommend this tank if you really want to fill your guns to 2900 psi. The number of poor reviews here and elsewhere should be a warning. Be aware that it is not considered defective if you only get 2600 psi since the listing states plus or minus 10%. The gauge is tiny and not easy to read. 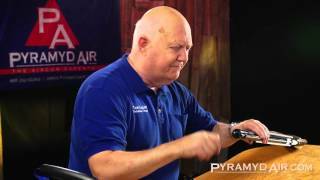 I just want to add that Pyramyd give me a full refund without a re-stocking fee. Their reputation is true. They have great customer service. Things I liked: I like the light weight and small size of this unit. I purchased an Air Force Talon SS with the 490 CC tank, and I quickly found out how much fun it wasnt to pump. This tank seems like a logical solution to solve this problem. I find it is relatively inexpensive to have filled at the dive shop. I also am very glad that it came with a regulator. It makes sense to have everything included as a package specially without breaking the bank. Things I would have changed: It wouldve been nice if this came with a carrying case or a reusable plastic case, but that really is a minor quibble. I also feel that the stopping points on the bleed valve is somewhat indistinct. 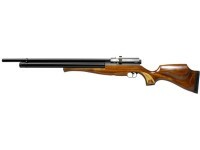 What others should know: The first time I attempted to fill my gun I ended up exhausting all of the air in the tank. I believe I had left the bleed valve open I only did that once. 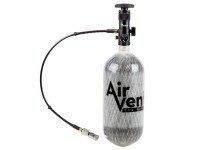 In order to get the air to flow from the tank to the gun you really have to turn that valve all the way. Also I experienced an issue with the tank tank leaking air. I was very relieved to know that I was still within the one-year warranty period.. Stacy at Air Venturi provided excellent support. Kudos to her. All is working well at the moment. 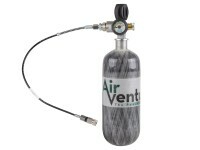 How many fills will I be able to get in my Hatsan Airmax (490cc) using this (88 Cu In) air tank? what is the manufacture date on this tank? 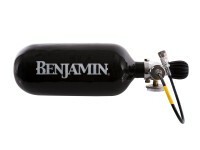 when filling from 1500 to around 2800, how many refills will I get for my Benjamin Marauder.